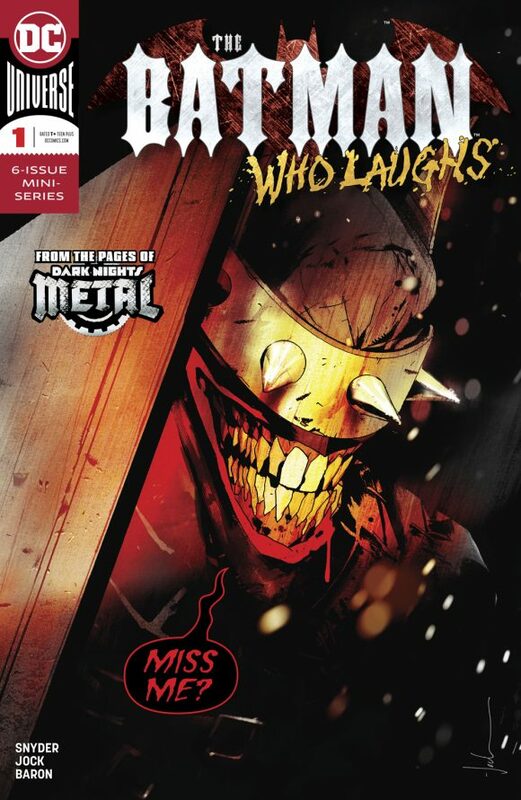 The Batman Who Laughs, the breakout bad guy from Scott Snyder and Greg Capullo’s Metal event, gets his own eponymous miniseries this week (12/12) by the writer and Jock. Dan: Tell us more about The Batman Who Laughs. What are you looking at there? 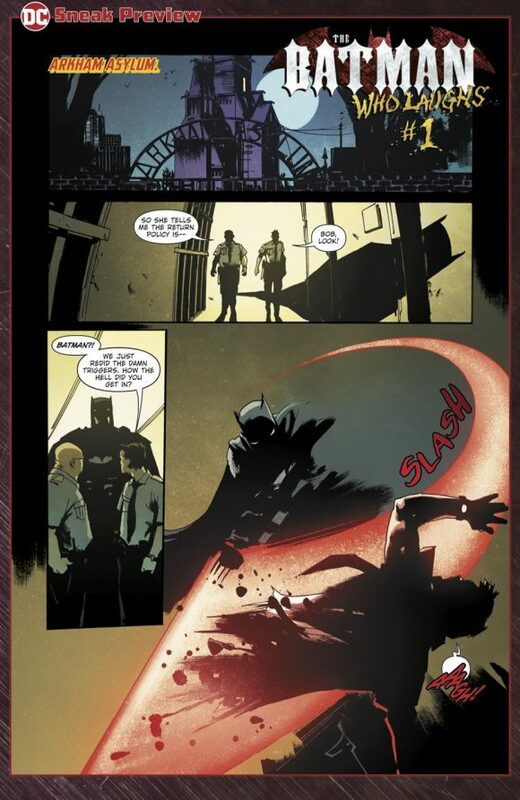 Scott Snyder: It’s kind of a spiritual successor to The Black Mirror for me, so it goes back to a lot of that dark early stuff we did on Batman, but it blows it out way bigger. This is a character I love. 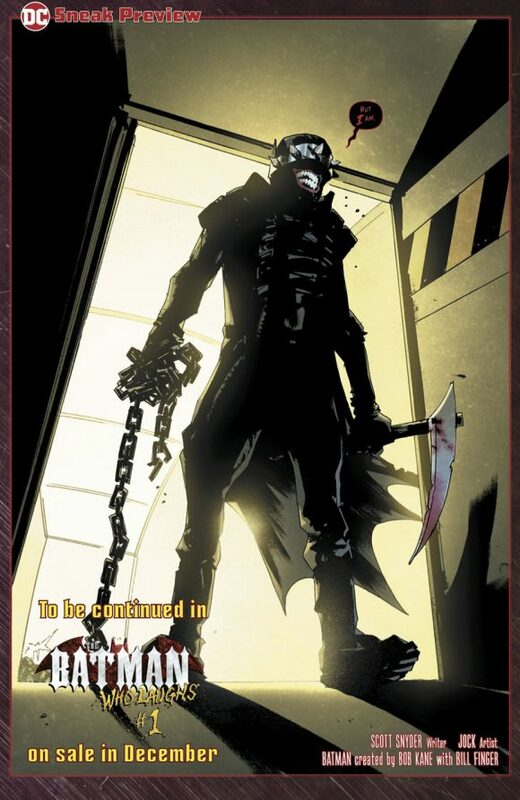 If somebody reading this doesn’t know the Batman Who Laughs, it’s essentially Bruce’s worst fear come to life: What if he killed the Joker, and the Joker had a toxin in his heart that made whoever killed him the next Joker. Batman becomes this incredible apex predator, all evil, all vicious, and he’s incredibly fun to write. He’s darker than the Joker — he’s kind of the shark of the DCU. The series explores all the things I didn’t get to do in Metal. It brings him to Gotham, and it brings him to conflict with not only Batman but Joker, and other villains — Penguin, Two-Face, Arkham, everything. And he’s brought another Batman here from the Dark Multiverse who’s called the Grim Knight. I’m very excited about him. 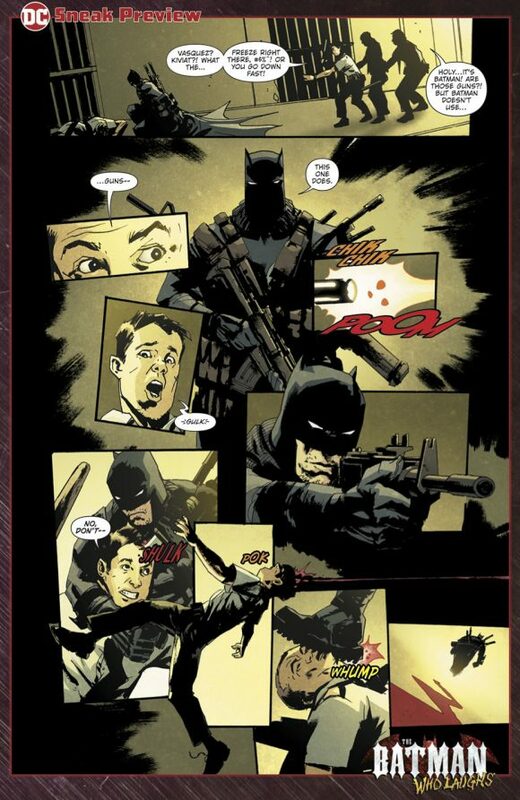 He’s essentially: What if, in the alley, Joe Chill drops the gun, young Bruce picks it up, kills Joe Chill, and realizes lethal force is the way to go for Batman? So, he is a sort-of Punisher Batman. Punisher to me is great, but Punisher is also kinda broke—whereas Batman runs a multibillion-dollar corporation. He could have stuff in your phone, in your car, in your apartment, so you could be driving on the road, he wants to off you, and you just go off a bridge. You wouldn’t even know it’s him. He’s like Iron Man, but lethal. He’s a terrifying version of Batman to me. He’s not something to be celebrated, he’s something to be feared, and the Batman Who Laughs has him in his pocket as a character who he’s gonna wreak havoc on Gotham with. It’s really easily the darkest Batman I’ve ever written, I think even more so than some of the Joker stuff, and it’s really personal to me. It’s about what truly makes Batman happy, and what is the nature of laughter itself. I’m very, very excited about it. — SCOTT SNYDER Teases JUSTICE LEAGUE’s Two-Year Plan. Click here. No thanks. I’m done with the dark stories. I’ve not purchased a BATMAN themed comic since pre-52 and even then was getting really spotty. My favorite era is very early Golden Age and the Bronze up to Crisis. Those Golden Age stories could be pretty dark!